Today I am going to Introduce a Newly launched Lip Balm in Indian market , a Revolution in Lip Care with Matra Lip Balms . Matra is a Luxuriously Natural skin care brand which offers pure , non toxic skin care products like Lip Balms. Their products are prepared in enviornmentally friendly manner . Their products are Cruelty free , Not tested on animals . 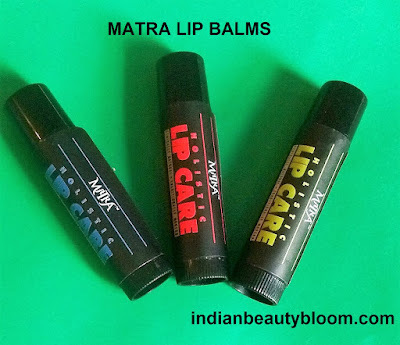 Their Lip Balms are 100 % natural and contains Vitamin A, C , E .
I got a chance to try all the three variants of Matra Lip Balm . I am quite happy to try these lip balms as I prefer Natural products. And these are natural ones , free from harsh chemicals and preservatives . And Lip Balm is an essential product in our skin care routine . This vanilla Ice variant is infused with Morrocan Gold and has SPF . 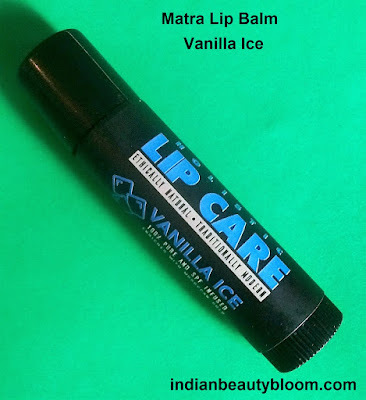 It moisturizes and soothes the Lips and protects from harsh sun rays . It’s light blue in color . This Lip balms is filled with essence of fresh Starwberries . It soothes the lips and provides Complete Lip Care . It looks pretty with a light pink color . 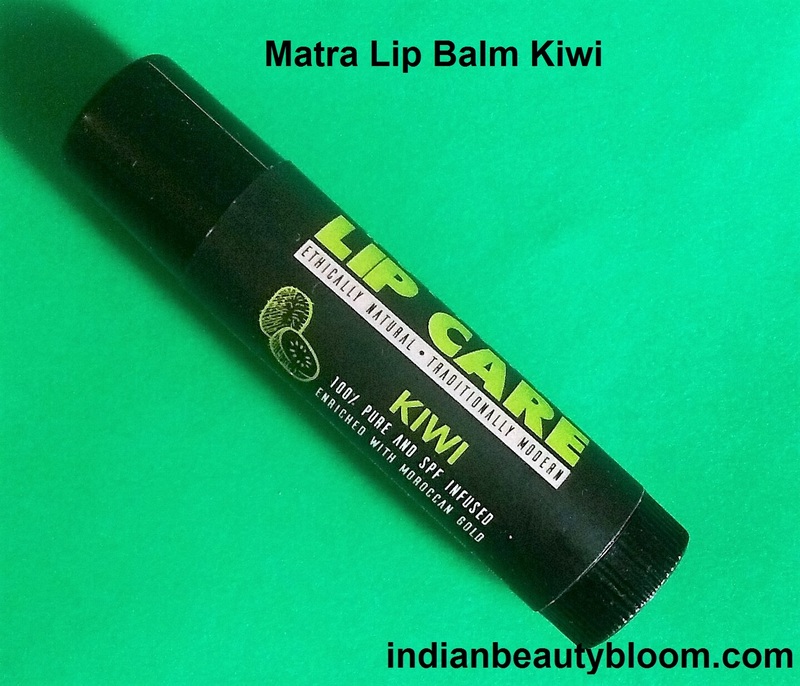 This Lip Balm has Flavor of Kiwi Fruit and Looks Great with a Green color . Price : Rs 199 for one . Product packaging is good . These Lip Balms come in a black Sleek packaging with the font color as the shade indicator . It’s a Travel Friendly pack . 2. Free of harsh chemicals and preservatives . 3. Free of Paraben . 4. Long Staying power . 5. Available in 3 Exotic variants . 6. Contains Vitamin A , C , E .
7. Cute Packaging & Travel Friendly pack . 8. Has SPF so protect the lips from harsh sun rays . 9. Moisturizes the lips . 10 . Heals cracked and chapped lips . 11. Suitable for all skin type . 1. 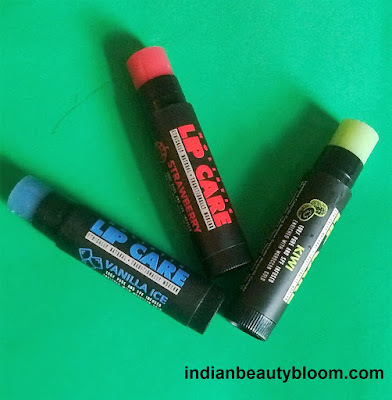 These Lip Balms are not Tinted , so we do not get any color as it happens in case of few lip balms from other brands . 2. Availability might be an issue as it’s a new product in market , so available only on online stores right now . I am using these lip balms past one week and I liked it . The product does it’s work well of moisturizing the lips . During the day time when we eat & drink , the lip balm stays only for 2-3 hours , one needs to reapply again . It’s ideal for a Night Skin care Routine as it stays for a long period of time , around 10-12 hours or we can say Overnight . 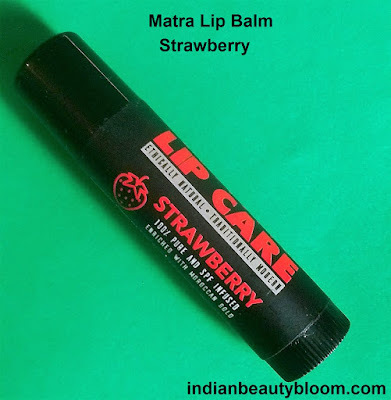 Over all I liked these lip balms as they do their work well and with an affordable price , cute packaging and all natural ingredients , they are worth trying .